This is a photo of Governor John Carlin shaking hands with Governor He of the Henan Province, while on his 1986 trip to China. 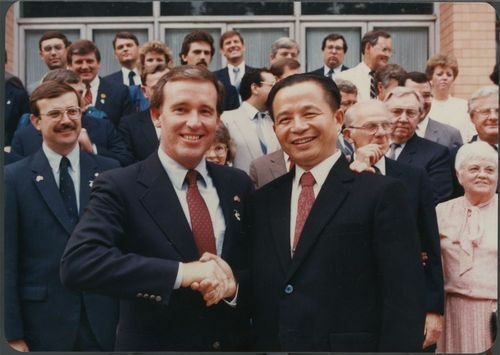 Governor Carlin led this and two other trips to China, one in 1979 and 1984 to explore potential economic, educational, scientific, and cultural exchanges between Kansas and the Peoples Republic of China. Henan Province and Kansas established a sister state relationship in 1981.